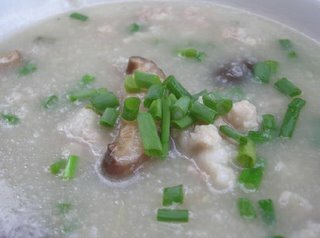 Congee with mushroom is Chinese Vegetarian Food. It's normally cooked for a very long time so that the rice becomes mushy. This menu for vegetarian and most famous of China, it’s easy for cooking and delicious. And then use in period Kin Jay festival. That is good idea for Vegan. 4. Slice the mushrooms and tofu, add to the rice soup and cook for 5 minutes longer. Enjoy your cooking is Congee with mushroom for Vegan.